TORONTO, ON – The Winter 2018 issue of the The Growler Ontario, a quarterly guide to the province’s craft brewing scene, is now available. 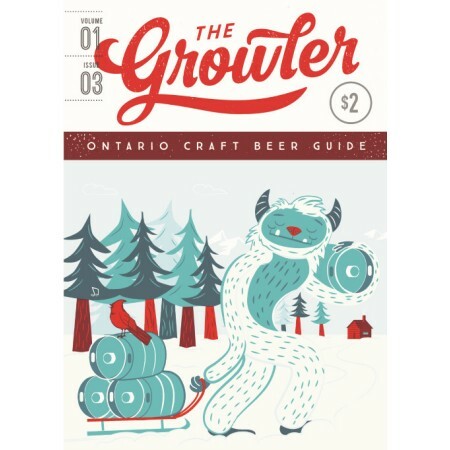 Similar to the original B.C.-based publication, each issue of The Growler Ontario features listings in which Ontario breweries are “mapped and profiled, letting you know what kind of beers are available, what amenities each brewery offers, where their beers are available.” Regions covered in this third issue include the Golden Horseshoe, Southwestern Ontario, and Eastern Ontario, with others to be added in future editions. For our winter issue, we’re breaking open the details on Ontario’s bought tap lines and sharing the good news about a new snitch line that might finally stop the practice. On a more festive note, we have a step-by-step on constructing an advent calendar for any occasion. Also, Matt Tweedy and Jeff Broeders, two heavyweights of Ontario’s beer scene duke it out in our Brewer vs. Brewer. Save the sunny escape for the end of winter and join us on a quick jaunt to Montreal. And it’s winter so that means we’re sucking back the oysters and this season it’s not just stout we’re drinking with them thanks to our oyster-pairing guide. The Growler Ontario Volume 1 Issue 3 will be available soon at brewery taprooms and newsstands throughout the province, with subscriptions and online orders shipping now. For more details, see the magazine’s Facebook page and Instagram feed.